Using “time travel” to prove past events (e.g moon landings) occurred? The light (images) from every event in the past are travelling through space at the speed of light as we speak. So.....I am going to build a powerful enough telescope and a spaceship capable of travelling at massively quicker than the speed of light. I will blast off into space and get, almost instantaneously, to a location where I can stop and turn around and point my extremely powerful telescope back at the light emitted from Earth. Could I theoretically zoom in on any part of that light and see if the Moon landings happened or who shot Kennedy, for example? Fascinated by any responses......assume anything is possible with regards to my spaceship and telescope and that I possess superhuman powers enabling me to survive the forces of superlight speed travel. It turns out that the quantum nature of light is a nearly-insurmountable barrier to doing this. Light is made of photons and you can't detect less than one photon. When a light gets very, very dim, it turns into occasional speckles here and there is you manage to detect a single photon. Sunlight hitting the Earth (or the Moon) is about 1017 photons/second/cm2. (Meaning that each square centimeter of surface -- like an astronaut's suit -- is struck by about 1017 photons/second.) Ignore absorption by the suit. Roughly, the photons incident on the scene are reflected into a hemisphere of space. OK, the Moon landing was fifty years ago, so to see the Moon Landing, you need to travel 50 light years out into space. Assume you have dealt with the geometric effects that @John Locke discusses in his interesting answer and actually do have a line of sight to the landing. 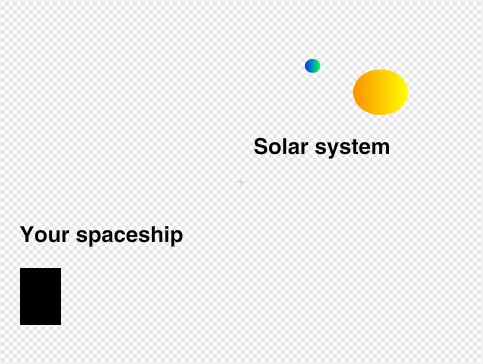 The photons emitted by the astronauts and the LEM will be spread over a half-sphere 50 ly in diameter. How many will enter your telescope? That's easy to compute. 50 light years is 5x1019 centimeters. A half-sphere with that radius has an area of 2x1040 cm2. Each cm2 of the scene on the Moon will be emitting 1017 photons/second, so each cm2 of your telescope's aperture will receive about 4x10-24 photons/second. 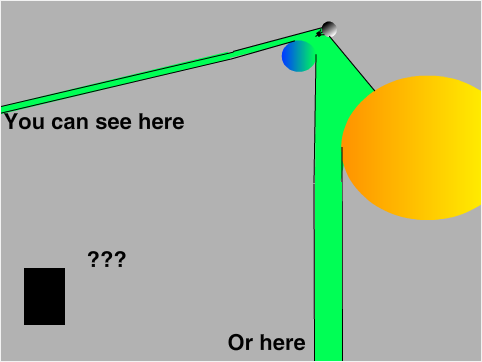 To get 1 photon/second from each cm2 of the scene, you'll need an aperture of 1/(4x10-24) cm2 or about 2x1023 (about a mole of square centimeters!). That's a mirror (or lens) diameter of about 5x1011 cm or five million km. That's pretty big. So, not physically impossible, but not a particularly easy thing to do. No matter how strong your telescope, you cannot see events on Earth. You cannot see through opaque objects like walls and ceilings. All of the light from Earth is also distorted by the atmosphere. For the Moon, you might be able to see the Moon landing because the Moon has no atmosphere. However, you have to account for the positions of the Earth and Moon when that happens because they can obscure your view the way a wall might. Your view would be obstructed by the curve of the Moon and by the Earth if you were behind it. You also have a poor view on one side of the Moon because the sunlight is shining toward you, so all you would be able to see is shadows. If we zoom back out, you can see that the Sun also blocks the view. 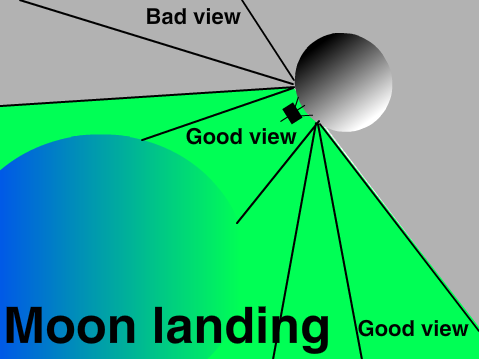 This means you only have 2 places to observe the landing if you happen to be behind the Sun and Earth. You have to choose where you will observe the event, you can't see it from just anywhere. I don't know where the Earth, Sun and Moon were during the Moon landing, this is just an example. These drawings also don't account for other planets or stars blocking the view. 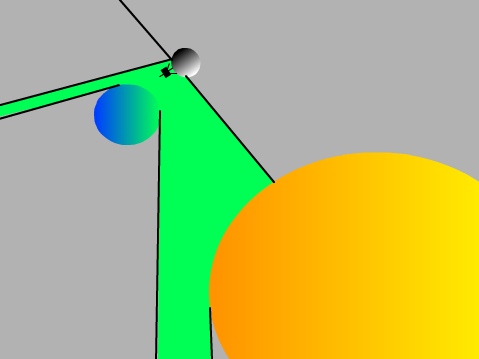 Additionally, you will want to account for gravity bending the light around the planets or suns. Do not head directly to the viewing spot. If you do, you will catch up and run into the photons you want to record. It would be better to take a path around those photons to be safe. I believe there is a mismatch between title and the question. I will attempt to answer both. Light waves has a problem called decoherence. Good images that we enjoy come from coherent sources. As the light waves traverse, they get more and more uncoherent. If you manage to capture the light at an event in a very near past, like a few seconds, you can recreate a blurry image. It will be more and more blurry until all meaningful data dies. If you manage to achieve time travel in another way, it might be possible. Current laws of physics only forbid information transfer from future to past. However, going to past without interfering with the past and bring information from the past is allowed. View the past by reflection?